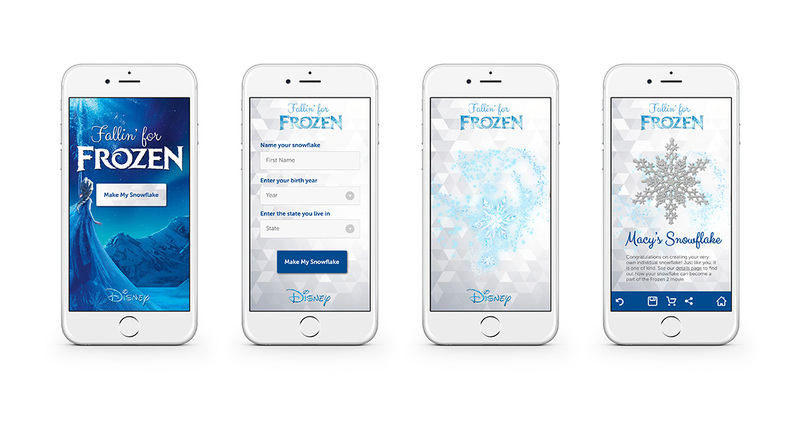 In 2015, Disney tapped my agency, Bailey Lauerman, to provide strategic thinking about keeping the Frozen momentum alive—two years after the movie release. As part of that effort, we came up with a snowday campaign. 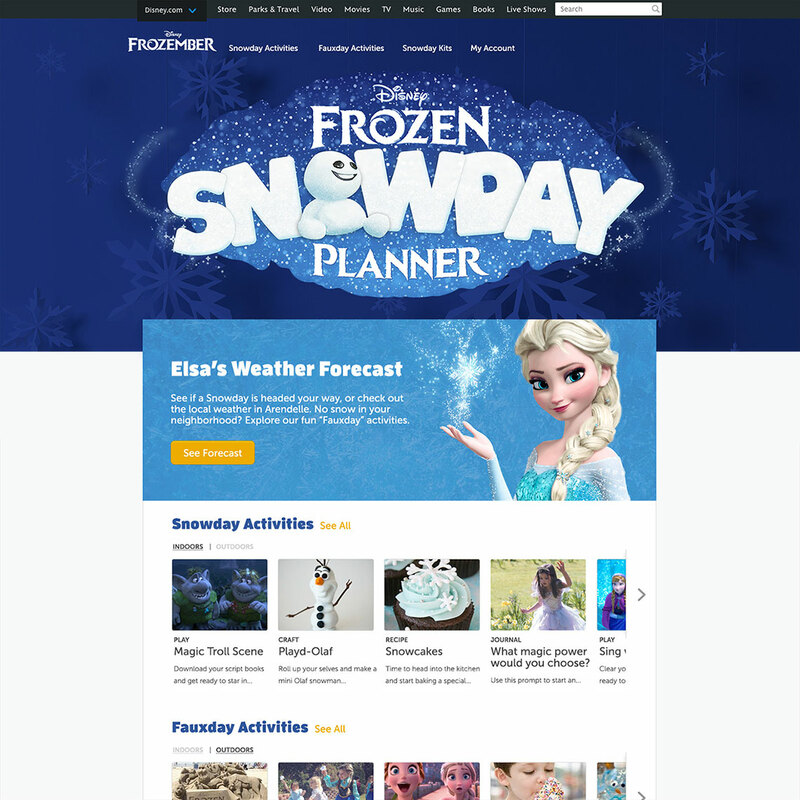 I designed the "Frozen Snowday Planner" logos, materials and site. Secondly, we were also asked to brainstorm digital concepts that might be incorporated into Frozen 2. For this, we concepted an interactive experience that had extensions for the movie along with tangible swag. As anyone in this business knows, not all good work ends up making the cut. While neither concept was officially picked up by Disney, we had a blast working on them. With this experience, users are invited to create their own snowflake which is just as unique as they are. That snowflake is then animated into a scene within the Frozen 2 movie. To create hype upon the release of Frozen 2, we imagined a way for individuals to find out the timecode during which their snowflake appeared in the movie. 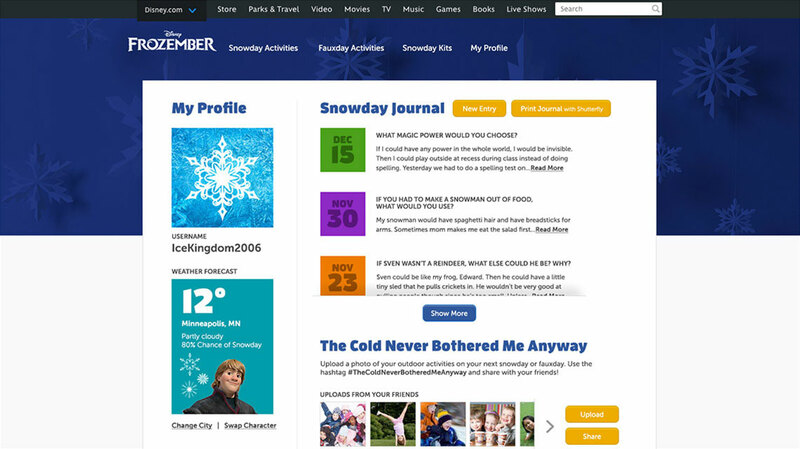 Through digital and DVD release, there is also a feature that allows users to explore the user-generated snowflake scenes—rotating, zooming in and clicking on the flakes to see who created each flake. Encouraging fans to be a part of this community of snowflakes, but retaining their own individuality within it, reinforces the mass following and heartfelt themes of the franchise. We didn't stop there. We also envisioned that individuals could shop swag that brought their custom snowflake to life as Christmas ornaments, Elsa necklaces and other timeless keepsakes.